Resulting in: An exception occurred while calling the 'OnImportsSatisfied' method on type 'Microsoft.VisualStudio.SharePoint.Designers.Package.ViewModels.PackageViewModel'. Resulting in: Cannot activate part 'Microsoft.VisualStudio.SharePoint.Designers.Package.ViewModels.PackageViewModel'. Resulting in: Cannot get export 'Microsoft.VisualStudio.SharePoint.Designers.Package.ViewModels.PackageViewModel (ContractName="Microsoft.VisualStudio.SharePoint.Designers.Package.ViewModels.IPackageViewModel")' from part 'Microsoft.VisualStudio.SharePoint.Designers.Package.ViewModels.PackageViewModel'. Resulting in: Cannot set import 'Microsoft.VisualStudio.SharePoint.Designers.Package.ViewProviders.PackageDesignViewProvider.ViewModel (ContractName="Microsoft.VisualStudio.SharePoint.Designers.Package.ViewModels.IPackageViewModel")' on part 'Microsoft.VisualStudio.SharePoint.Designers.Package.ViewProviders.PackageDesignViewProvider'. 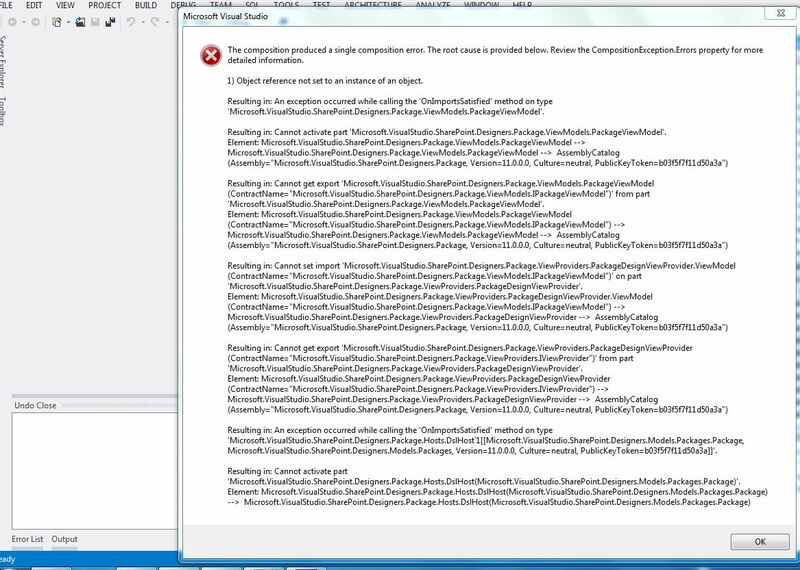 Resulting in: Cannot get export 'Microsoft.VisualStudio.SharePoint.Designers.Package.ViewProviders.PackageDesignViewProvider (ContractName="Microsoft.VisualStudio.SharePoint.Designers.Package.ViewProviders.IViewProvider")' from part 'Microsoft.VisualStudio.SharePoint.Designers.Package.ViewProviders.PackageDesignViewProvider'. Resulting in: An exception occurred while calling the 'OnImportsSatisfied' method on type 'Microsoft.VisualStudio.SharePoint.Designers.Package.Hosts.DslHost`1[[Microsoft.VisualStudio.SharePoint.Designers.Models.Packages.Package, Microsoft.VisualStudio.SharePoint.Designers.Models.Packages, Version=11.0.0.0, Culture=neutral, PublicKeyToken=b03f5f7f11d50a3a]]'. Resulting in: Cannot activate part 'Microsoft.VisualStudio.SharePoint.Designers.Package.Hosts.DslHost(Microsoft.VisualStudio.SharePoint.Designers.Models.Packages.Package)'. AFAIK you can't create SharePoint 2010 solutions (package WSP) with VS2012 coz 2012 tools supports only SP2013 (csproj and project structure are very similar though). You probably can build dll (library) with VS2012 and SP2010 referenced dlls and than use wspbuilder to create wsp targeting SP2013 (good compatibility with SP2013, will be deployed to 2010 hive). Not the answer you're looking for? Browse other questions tagged c# visual-studio-2012 sharepoint-2010 or ask your own question.